This review presents in a very condensed form the detailed results of a recent book by Jean Guex (2016; with references therein; see also Torday 2015, 2016) with a foreword of Alexej Verkhratsky on the retrograde evolution of invertebrates during major extinction periods. The first chapter of the book concerns the most common evolutionary trends described in the literature, showing more or less gradual geometrical and ornamental transformations occurring over long periods of ecologically stable periods. The most frequent is the increase of the size during the evolution of several phyla. It is commonly observed in foraminifera, ammonoids, nasselarian radiolarians, nautiloids and vertebrates. During massive extinction periods occurring through the Phanerozoic we observe major evolutionary jumps in several invertebrate groups. In such cases, the jumps are characterised by the appearance of primitive forms resembling remote ancestors of their immediate progenitors which can be defined as atavistic. The homeomorphic species generated during sublethal environmental stress can be separated from the ancestral group by several millions of years. The evolution of silicoflagellids is discussed as an example of application of artificial stress to modern organisms. In this paper we summarize a new theoretical model of retrograde evolutionary changes during major extinction periods, first published in the recent book mentioned above (Guex 2016). 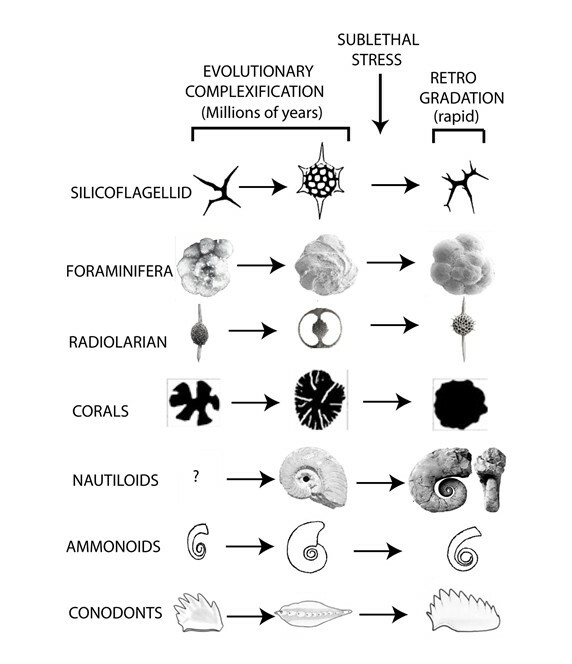 A diagrammatic presentation of the evolutionary patterns of some planktonic foraminifera, radiolarians, nautiloids, conodonts, corals and ammonoids is given in fig. 1. That diagram shows that the evolutionary complexifications of those invertebrates, lasting for very long periods, follow roughly the rules of Haeckel (1902). Reversals in the evolutionary patterns are observed during short periods of major crises. Fig 1 Simplified and diagrammatic representation of the evolutionary lineages mentioned in the main text and their reaction to catastrophic events. Not to scale. Silicoflagellids (Cretaceous – recent). Foraminifera (Ticinella-Thalmanninella lineage – Cenomanian anoxy). Radiolarian (Saturnalids at the Cretaceous – Caenozoic boundary). Corals(Zardinophyllum lineage at theTriassic-Jurassic transition). Nautiloids (Domatoceras-Gyronautilus around the Permian Triassic transition. Ammonoids ( uncoiling during Jurassic and cretaceous crises). Conodonts (Evolution of the “Neospathodus” group during the Permian Triassic transition). From Guex 2016. Fig.1 summarizes in an extremely simplified way the evolutionary cases discussed in our book. It shows that most of the evolutionary innovations are accumulated peramorphically (by “terminal addition” in the haeckelian terminology) over long periods of time (Guex et al 2012) It is precisely these newly acquired characters which are generally lost during periods of sublethal stress that are always much shorter than the recovery periods (a few thousand years vs several millions of years). The more generalized (=plesiomorphic) characters are also much more stable. This suggests that another possible mechanism could involve the genetic switching of Schlichtling and Pigliucci (1998) (see also Badyaev 2005). If this were true, we could speculate that some regulatory genes controlling the development of the newly acquired characters could be switched off at certain concentrations of pollutants (or under some sublethal temperature conditions) and switched on at normal concentrations. However that hypothesis cannot explain the usual cases where atavistic forms generated under extreme environmental stress are indeed giving rise to completely new lineages that are not identical to the ancestral one. Whatever the cause (genetic or biochemical) of the reversal processes discussed in our book, we note that it is very easy to inhibit the development of morphological novelties accumulated over several millions of years and to “reinitialize” the evolutionary clock of organisms submitted to high environmental perturbations leading to extinctions. Our examples demonstrate clearly that multicellulars follow basically the same kind of evolutionary transformation (peramorphoses or atavisms) as their unicellular ancestors by accumulating new characters in an haeckelian way (see also Torday 2015).In other words the basic morphogenetic rules are the same as in unicellulars but they are spreading all along the ontogeny of the multicellulars. In summary we can say that in both, unicellular and metazoans, most of the anagenetic evolution occurs by addition of new characters during long periods of time (several millions of years). Retrograde evolution is catastrophic in the sense of Thom (1972): in our above mentioned book we use the cusp catastrophe to represent the evolutionary retrogradations occurring during extreme environmental stress (instantaneous in geological time). These diagrams show one simple thing: we can note that the retrogradations occur in exactly the same way in protists/unicellular and in metazoans. In other words it seems that the problem can be reduced to isolated cells communicating only with the external marine environment, the morphogenesis and phylogeny being strictly controlled by intracellular signals, which are not yet well understood. Jean Guex (2016). Retrograde evolution during major extinction crises. Springerbriefs in Evolutionary Biology. (Personal copies: write to Jean.Guex@unil.ch). Torday JS (2016). Heterochrony as Diachronically Modified Cell-Cell Interactions.